Every year the Dallas Ft. Worth Costumers Guild hosts a stunning Georgian Picnic, and every year us on the east coast wish we were as cool. So this year Amanda and I decided we should have a knock off version here. Think of it as the bag you buy on the street that’s by “Coach” but they spelled it with a K.
We set a really wide date range as “Georgian” can go 1714-1830 if you really push it, so anyone who wanted to come could find an outfit. 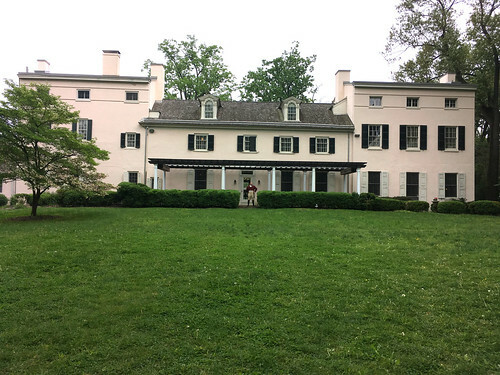 The location we picked was Historic Strawberry Mansion in Fairmount Park, Philadelphia (mostly on a random internet search and let me tell you it was perfection and they are SO NICE). As Strawberry Mansion was heavy remodeled in the Federal Style I decided I wanted something at the turn of the century. Years ago Amanda gave me this gorgeous copper silk that told me it wanted to be an open robe, then I just hadn’t had an event to make said open robe FOR and it languished…no longer! Looking around I was heavily inspired by robes with elaborate pleated backs. What can I say I’m incapable of picking the easy thing. 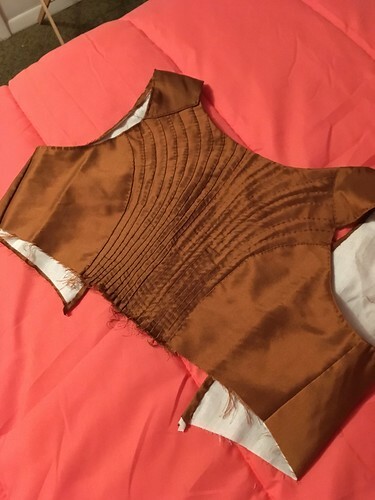 I started with my basic regency bodice, which is a heavily bastardized version of the Simplicity regency pattern. Did two more mock ups than I would like to discuss and cut out the lining from plain cotton broadcloth. Then I cut a width of silk a few inches longer than my center back length to allow for wiggle room. I started by folding the width in half. This silk was 40″ wide giving me 20″ of pleating on each side. 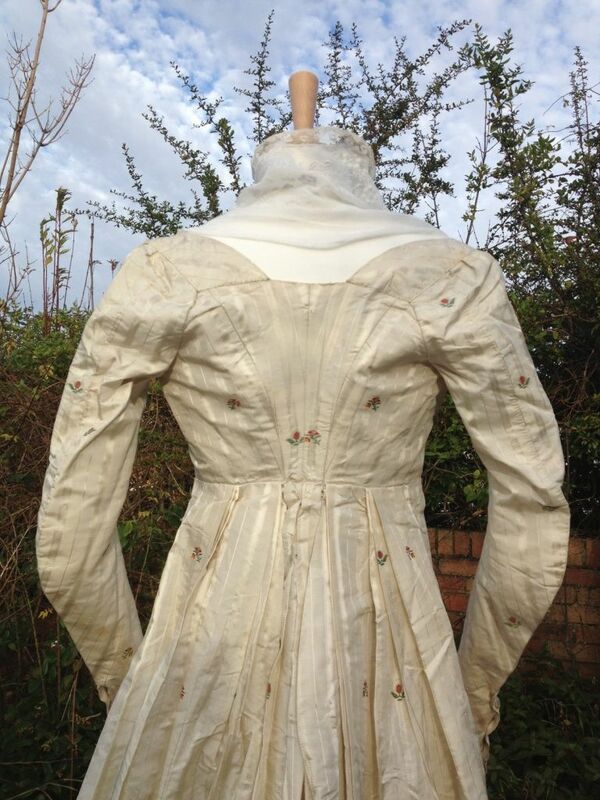 But if you had wider fabric you could use deeper pleats or take them all the way to the edges. In the above photo you can see that the first time I pleated it up I went with more vertical parallel pleats and decided they weren’t as flattering as curving them. I promise it only LOOKS asymmetrical because I hadn’t trimmed it evenly…and got most of the way through and realized I had 10 pleats on one side and 11 on the other…I curse a lot then fixed it. 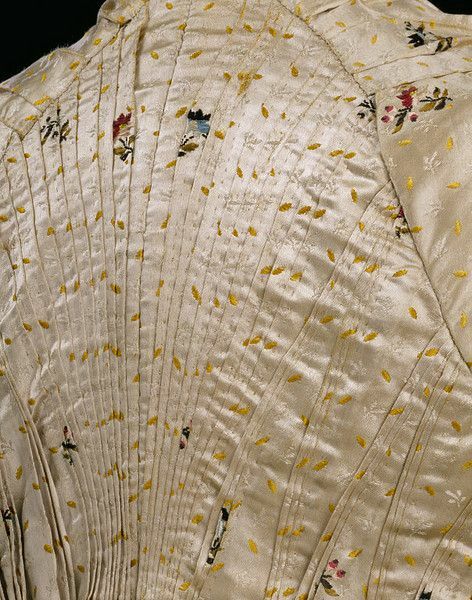 From there it was a “simple” matter of carefully sewing down down the pleats. One at a time. After I sewed all the pleats down I laid the pattern back over the back and trued up the piece as it had skewed and stretched with sewing. I folded the side of the side backs down and top stitched them down so they would blend with the rest of the pleats. I hemmed the neckline, armscyes and sewed the two skirt panels together….then I was out of time. I had a 12 hour work day and then guests coming and the poor thing was going to be in the UFO bin forever…but did I mention how AMAZING my friends are? I walked in the door from work on Friday night and Carolyn and Taylor were hemming my skirt..and did I mention they’re hella faster than I am at hand sewing? Basically what I’m saying is I can claim like 50% of this dress. And I am enterally grateful to them because I felt SO FANTASTIC wearing it. My “turban” is just a strip of leftover silk. I’m wearing the Dames a la mode Jane Austen cross and new turquoise earrings. Thank you to Taylor, Carolyn, Adrienne and Amanda for photos!